Why take a chance on a boring party? We're mobile! We will come to you for a fantastic party. Everyone wants their party to be a hit. A party is no party without great games, and what better game to play than laser tag? We have the games. Our mobile service delivers a super fun and super easy laser tag experience throughout metro DC/MD/VA and Florida. We have helped families host the best birthday parties since 2003, often the same family multiple times. We frequently hear from guests about what a fantastic time they’ve had and that our party was the best ever. All our chaperoned parties are custom tailored for each event, host, and guests. We happily accommodate everyone including younger siblings, parents, grandparents and players with special needs. We can easily handle any group size, large, small or enormous. We can play indoors or outdoors. Call us or book today. Our chaperoned parties book weeks in advance. Our weekend rental program was created for families that waited too long to book a chaperoned event and is available on much shorter notice. Please let us know if there are any areas of concern. I am happy to discuss your concerns and help find solutions. Our laser tag can be played during the day or night and in light rain, fog, and snow. Weather is not a big deal, Should there be a thunderstorm or other severe weather, we’ll gladly reschedule you for another day. We regularly have mothers tell us the kids said the party was even better in the rain. If you have areas of concern in your yard or facility and we can cordon them off. Tom did an amazing job for my daughter, Sydney’s 10th birthday party! I could not have asked for more amazing way to ring in double digits! Tom was an amazing leader and to round up 14 ten yr old girls you know that takes some talent! I loved the small business feel of Toms Laser tag but with quality equipment, professionalism and a whole lot of fun! We will be hiring Tom again ... maybe next time for an adults only party! Fantastic!! The children (all ages participated) LOVED THIS! They gave requested it again next year, and with five sons, believe me I know good parties. Girls and boys alike aired it and Tom so clearly loves what he does and it shows. He managed everything and gets them into it. No dark required, it was daylight and super fun. This is a party you must try!! — Erika Leon, St Petersburg, FL. 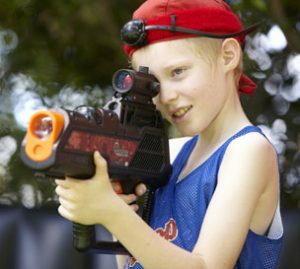 Tom is the most reliable, the most authentic LASER TAG COMPANY out there. We met Tom 8 years ago when I made my husband a SURPRISE laser tag birthday party!! Boy was it a hit. The big boys had the best time ever!! Since then Tom has traveled from Maryland to NY 5 more times for birthday parties for our 3 boys. We thank you TOM OAKS for being so accommodating and bring such an authentic experiecne for the children. They ALL love you!! You are a one of a kind. We thank you for everything!! We can't wait to see you soon for SAMMY'S party!! Safe travels! !